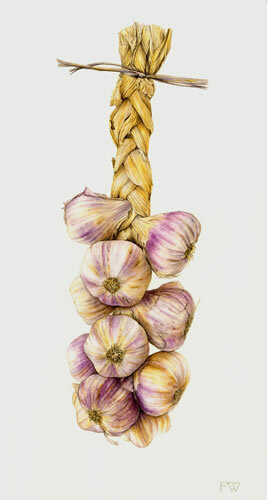 Garlic- Painting by Botanical Artist Fiona wheeler - member of The Society of Floral Painters and Guildford Art Society - Private commissions invitedBotanical Art - Fiona Wheeler, Botanical Artist Woking Surrey near London England - Botanical artist. Giclee prints are digital, high resolution prints using light fast inks which produce an image nearly identical to the original. All limited edition prints are produced on fine art paper and are signed (with monogram) and numbered by the artist. The printer is a member of the Fine Art Trade Guild. Note: There may be slight variations in colour for the pictures displayed, depending on your pc & screen and limitations of photographic and scanning equipment and related processes. Image sizes are approximate.